It’s been almost a full month since I posted the first few sketches of my forty-ounce painting. Though I’m disappointed I haven’t been able to post as often as I’d like, I understand my pace will have to fluctuate depending on the time of year. I’m in a teaching internship now, so my current time usage is probably similar to what it’ll be when I’m full-time. But I’ll have summers off! And I fully intend to capitalize on that. For now, I work with what time I can get. I feel like I begin with that statement every other post. For a few months after I took a class with Numael Pulido, I was painting using medium. First I used a mixture and then I switched to liquin. My paintings took a leap forward at this time. Then I began painting on smaller canvases, trying to get faster. I stopped using medium and went back to using oil straight from the tube. This was also partly because I’d read that the use of liquin can yellow a painting over time. But it seems from what I read now that most anything can yellow a painting over time. Recently I’ve been trying to improve my technique by addressing issues like canvas texture and varnishing, so naturally I decided to readopt the use of medium as well. For my latest painting, 45 and Bulbs, I prepared the canvas with five or six watered down coats of gesso. I sanded the surface to give it a very slight, varied texture. I’ve grown to hate the uniform tooth of factory canvas. I did everything I could to counteract it. After the gesso dried, I toned it all in a medium blue-gray. I started off taking progress pictures but became frustrated with the lighting. The days are getting depressingly short and I struggled to get good pictures with the dying light. After three or four attempts, I gave up. I sketched out the general shapes with burnt umber. I didn’t spend too much time on the preliminary drawing since I’d spent so much time sketching the setup already. I wonder how other artists view the process of painting. To me, it’s like building a pyramid out of blocks. The largest blocks go on the bottom and every following layer uses slightly smaller blocks to build towards the pointed top. I lay out blocks of color in my paintings and then come back around searching for the next smallest blocks of color. Rinse and repeat. Though I struggled with the reflections in the lightbulbs and the foreground shadows, the most difficult task was keeping everything level and straight. Even now it seems the angles are off. The background and foreground are two different beach towels. I’m trying to use patterns in all my still life paintings. Soon I’ll be digging through the bed sheet piles at Goodwill. 45 and Bulbs is 12″ x 16″ and on sale for $500. If you’re interested in purchasing this painting contact me at thewritingmann@gmail.com. Crash course in high school English: The Birthday Party – Brush, The Handsomest Drowned Man in the World – Marquez, The Lone Ranger and Tonto Fistfight in Heaven – Alexie, The Dome – Millhauser, 1984 – Orwell, Brave New World – Huxley, and Feed – Anderson. I’ve been working with these titles for the first quarter of my internship. Some of the stories I’d read a while ago, but many were new. I’ve been busy reading and grading and researching and planning. In my free time I’ve been working on a new oil painting, but it’s not quite done yet. In order to keep this blog alive and prove I’m still interested in the arts, I took a snippet of free time on Saturday and painted out a gourd in gouache. Before heading north to Maine for a murder mystery party, my girlfriend spent an hour or so making an appetizer to bring and I plopped down at the kitchen table to hash out this 6″ x 3.5″ painting. 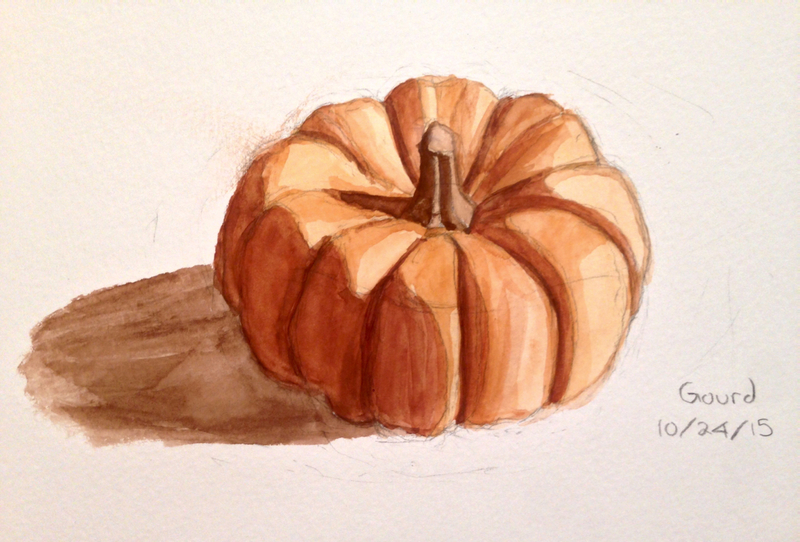 Small gourds are wonderful to draw and paint because they have distinct angles and planes. I have a couple other gourds and pumpkins floating around the apartment. Hopefully they’ll feature in my next oil painting.